Cats are pretty stubborn, or at least mine are. I don’t know about yours, but I’m willing to be they are stubborn too. In my experience, it’s been tougher to train cats to stay off of furniture than dogs. How can you train a cat to keep off of furniture? Nimble cats are harder to control, but tinfoil or an upside-down carpet runner on your furniture should deter them. You can also purchase motion-activated devices that deliver a harmless puff of air or spray of citronella to deter pets. Most cats won’t stand for a leash, so simply pick your kitty up off the furniture when it’s breaking the rule. Offer a comfortable alternative to your sofa, such as a fluffy dog bed or a cat tree or perch in the same room. Teach your pet to enjoy time on its own furniture: Keep the dog bed near a couch leg, and give the dog a treat to chew while you’re relaxing there, too; do the same with a cat and its perch. That seems pretty reasonable. I didn’t have much luck with the “simply picking cat off furniture” rule, they just kept coming back. But the scent tips can help. You just have to find a scent that your cats react to. But the best tip is the alternative furniture tip. It’s the best, in my opinion. My wife and I do this thing where we just move cat-specific furniture around, periodically, to make the cats like it more. They always like when something is sitting in a new place, so we use this strategy to entice them to sit on things we want them to sit on. 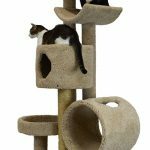 We’ll simply move one of their cat trees or chairs to a new spot in the room, and instantly it’s much more interesting than all the other furniture in the room. I guess just because it is in a new spot. Cats are funny like that.